When you think of the small town of Katy, rice farms and gas fields may come to mind, or perhaps you think of a day of shopping at the town’s outlet mall or numerous antique shops. Before industry moved in, the land that is now Katy was a hunting ground for the Karankawa Indian tribes. They hunted herds of buffalo, longhorn cattle, deer, and large flocks of wild geese, ducks and other game birds, before the first community was settled in 1872. While stories about the Indians and buffalo can be read about in history books, scientists believe there was life on this very part of the state long before the mid 1800s. In fact, many believe this land in southeast Texas has a history dating back to the end of the last Ice Age, approximately 11,000 to 12,000 years. But 12,000 years is as far back as scientists could trace prehistoric life in the Katy area until an amateur fossil collector started digging in a trench along Cypress Creek, inside the Katy Prairie Conservancy. He pulled out several mammoth tusks and called Texas A&M University. Professors there called Sam Houston State University biology professor Patrick Lewis. “It turns out that this site in Katy preserves the height of the last Ice Age; it’s about 50,000 to 60,000 years old, we think,” said Lewis. “There are several sites in east Texas that date to the end of the last Ice Age, but there’s not any that date to this age where things are at their coldest. We’re talking about a time when the last Ice Age is really getting going. We’re interested to see what animals were like then, so we can compare them to the end of the Ice Age,” said Lewis. In May, Lewis, his fellow colleagues and students at SHSU teamed up with researchers from the University of Texas, Texas A&M University, and Texas Tech University to excavate numerous other remains from the site. Among their discoveries were two different species of horse, including a small three-toed breed, camels, sloths, mammoths and proboscideans, which are related to the mammoth. One discovery Lewis and his team made may forever change the way scientists view the Ice Age and its impact on North America. “We found the remains of a Toxodont. A lot of people probably have never heard of it, but it is a big rhinoceros type of animal that was only known to have lived in South America. This is the first ever known Toxodont in North America; that’s exciting,” Lewis said. Toxodonts are believed to have roamed regions of South America and were approximately nine feet long and nearly five feet tall at the shoulder, resembling a large rhinoceros with a head similar to a hippopotamus. So far, Lewis and fellow researchers have found what they feel positive is a molar of a Toxodont. Lewis said Toxodont molars are so distinctive, there is no doubt that is what they found in Katy. The team feels encouraged they will find more evidence of prehistoric life when it returns to the conservancy in January, Lewis said. Lewis and his team plan to camp at the site for about a week, gathering evidence they hope will lead to answers to some very important questions: What happened to the large mammals on the continent and why did they go extinct? What happens to mammal faunas when the climate rapidly warms? And, was there a connection between North and South America that ran along coastal Texas? It will likely take years for Lewis and his team to answer the unknown, but for now they will continue preparing the bones they already have and continue searching for others. 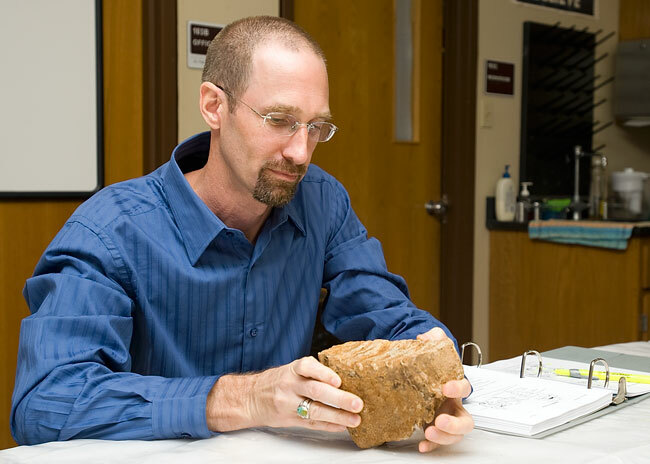 The more evidence they find, the more accurate they’ll be in determining the true age of this site, which so far suggests there was life in Katy at least 50,000 years ago.